Teej is a Hindu festival and is a three-day long festival. Teej is dedicated and to Lord Shiva and goddess Parvati. It is celebrated by the married brides. Teej festival falls in the monsoon season that is, shravana or bhado. There is no fixed date of this festival as it determined by the moon cycle but it falls between July - September. Teej is very popular in Nepal and northern states of India like Rajasthan, Haryana, Bihar, Uttar Pradesh and Punjab. It is also celebrated by Sindhi community by the name of Teejri. Every married woman keeps fast for their husband's long-life. There are three kinds of teej namely, Hariyali Teej, kajari teej and hartalika teej. Teej plays a significant role in a married women's lives as it strengthens the bond between her and her beloved husband. In Hindu mythology, it is said that was the day when the divine couple lord Shiva and goddess Parvati had reunited after around 100 years. Teej is a festival which shows the devotion of goddess Parvati towards lord Shiva. On this auspicious day, married women commemorate this day by keeping nirjara vrat that is fast without having any food and water for their husband. Teej strengthens the bond between the married couple. While the wife keeps fast for their husband's long life, husbands reciprocate the gesture of love by taking special care of their wife and by gifting them something like saree, jewelry, makeup or any other things they like. Like any other Hindu festival, Teej has its own customs, rituals and importance. Married women who observe fast has to take special care so that nothing spoils their fast. Ladies start preparing for Teej a week prior the festival like buying new clothes, jewelry and all other things required for puja and rituals related to the festival. Many rituals are followed by the married ladies on Teej festival. Married women visits and stays at their parent's house on Teej. On this festival, the father-in-law gives many gifts to the daughter in law or would be daughter-in-law according to the customs. The gift is known sindhare or shrinjhara. This gift includes all items of shinghar that is all adorns of married women things includes ghewar (a type of sweets), laheria dress, henna or mehendi and lac bangles. 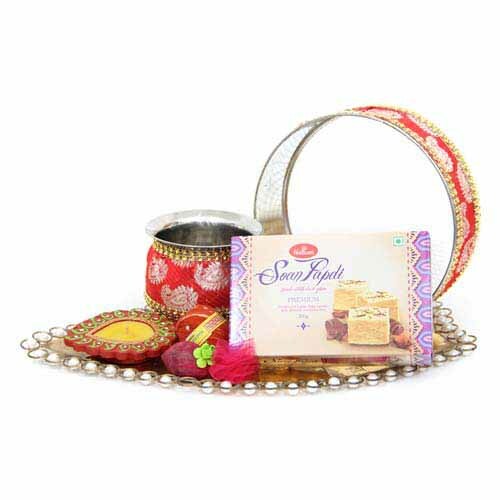 It is also a traditional gift package or hampers given to the married women who observe fast and is given by the mother of newly married girls. This includes dry fruits, mathri, red dress or saree, jewellery. On Teej, married women and engaged girls are asked to wear their best colorful traditional outfit and have to be nicely groomed for the entire day. Ladies apply mehndi or alta on their hands and even legs. They wear gold jewelry. The married or unmarried girls keep fast for their husband for the entire day and it the fast lasts for 24 hrs. In Haryana, swings also known as jhula is tied or hung and are decorated with flowers and women who celebrate Teej sit and swing on it. Women come together and celebrate this day by singing songs. On this day, ladies who keep fast have to light an oil lamp or diya and have to keep it lightened throughout the day. Teej puja is done differently. Ladies gather together in the temple and worship goddess Parvati or they sit on the ground together making a big circle and keep all pooja thaalis and fruits in between and starts narrating teej katha. It is said that on this day goddess parvati or took birth 108 times to meet lord shiva. All women are dressed in their best outfit and after the katha they offer fruits, sweets and coins to goddess Parvati. Celebrate Teej by sending Teej Gifts to your loved ones.